Full Color Soft Surface Mouse Pad - 6" x 8" x 1/16"
About this Non - Skid Computer Mouse Pad:Everyone needs a mouse pad, so why not put your logo on one? With a large imprint area for Screen Printing you can be sure your message is clear as day every time your customer powers up their computer. Made of a Non-Skid Foam Rubber Base, this computer mouse pad is durable and sure to last.Special Instructions:Rush Service:Catalog Quantities Only.One Color And One Location. About this 4- in -1 Rectangle Microfiber Mousepad Cleaning Cloth:The 4-in-1 Rectangular Microfiber Mousepad form AnyPromo is not only a mouse pad, it's a microfiber cloth and can function as an anti-slip surface or screen protector for laptops. Customized with full-color CMYK printing that covers the whole front of the microfiber mouse pad (10.25" x 6.3"). The 4-in-1 Microfiber Mousepad is a customer-voted "Top 100" item because it's the perfect computer and laptop accessory. Nothing is more convenient than using your mouse pad to clean dust off your screen and wipe smudges from your phone. Best of all, this all-purpose microfiber cloth and mouse pad comes with a generously large imprint area that's great for brand exposure. If you're looking for a giveaway your customers will keep with their laptop, this microfiber laptop mouse pad may be for you. It's an accessory that will give your brand exposure every time it's used. More details about the 4-in-1 Microfiber Mousepad Cleaning Cloth: This mouse-pad is the ultimate on-the-go computer companion. Full color process makes your logo truly pop. Printed on the highest quality microfiber- this item goes from mouse-pad to screen cleaner instantly. The Tekpad also makes the perfect anti-slip buffer for your laptop to rest on. Thin enough to enclose in most standard laptops, this amazing item also is a great buffer to help protect your laptop screen. Approximately 1/16" thickness. Looking for a product that can carry a good print? This multi-purpose microfiber mouse pad is a customer favorite because it's not only the ultimate laptop accessory, it features full color printing on the whole surface and is budget-friendly. Mouse Pad Microﬁber Cloth Laptop Screen Protector Non-Slip Surface Soft Microfiber Made with soft microfiber cloth that won't scratch delicate surfaces and can be used to clean computer monitors, smartphone screens, lenses, and more. Slip Free Bottom Has a slip-free textured rubber underside that prevents it from sliding around and makes it great for use as either a mousepad or a non-slip surface. Full Color Print Looking to print a colorful logo or design? The 4-In-1 Microfiber Mouse Pad features full color CMYK process printing that covers the whole surface. About this Solid Jersey Gel Mouse Pad / Wrist Rest:Soft, gel padding.Material: Polyester surface.Special Instructions:1 Day Rush, available upon request for 1 color, 1 imprint location orders. About this BIC(R) Paper Mouse Pad - 50 sheets:Non-slip chipboard backing. Materials: 60# Offset Paper; Contains 30% Post-Consumer Recycled Fiber. About this Cutter Buck(R) Legacy Mouse Pad:Finely crafted with Legacy leather and classic Cutter & Buck detailing. This mouse pad adds elegance to any desk. The non-skid base keeps the mouse pad in place on any surface. Manufactured By Leeds. Materials: LeatherSpecial Instructions:Other imprint methods/areas may be available; please call for details. Please note that product images may not depict the standard imprint method included in pricing. About this 1/8 Rectangular Foam Mouse Pad:1/8" foam backing.Computer mouse pad.PMS matching not available on Digital Heat Transfers.See General Information page for applicable Digital Heat Transfer charges.Material: Polyurethane foam with polyester surface. Related Search Terms: Mouse Pad Special Instructions:1 Day Rush, available upon request for 1 color, 1 imprint location orders. About this 1/8 Rectangular Rubber Mouse Pad:1/8" rubber backing.Material: Natural rubber backing with polyester surface.Computer mouse pad. PMS matching not available on Digital Heat Transfers.See General Information page for applicable Digital Heat Transfer charges.Special Instructions:1 Day Rush, available upon request for 1 color, 1 imprint location orders. About this 1/4 Rectangular Rubber Mouse Pad:1/4" rubber backing.Material: Natural rubber backing with polyester surface.Computer mouse pad. PMS matching not available on Digital Heat Transfers.See General Information page for applicable Digital Heat Transfer charges.Special Instructions:1 Day Rush, available upon request for 1 color, 1 imprint location orders. About this Wireless Charging Mouse Pad:This wireless charging mouse pad is perfect for any desk. Simply use the kickstand on the back to prop up the top portion to charge your wireless charging smartphone while using the mouse pad and save desk space. Compatible phones include some of the following: Apple iPhone: 8, 8 Plus, X, XR, XS, XS MAX Samsung Galaxy: Note 9, S9, S9+, Note 8, S8, S8+, S7, S7 Edge (Plus more devices) Sony: Xperia XZ3, Xperia XZ2 Premium, Xperia XZ2 (Plus more devices) *Please check your device specifications prior to purchase. Special Instructions:Other imprint methods/areas may be available; please call for details. Please note that product images may not depict the standard imprint method included in pricing. About this Mouse Pad with To - Do List:This PP mouse pad with 12pags To-Do List papers.This 2 in 1 item offers convenience as much as possible when you want to write done the key messages. Material: Polypropylene.Special Instructions:1 Day Rush, available upon request for 1 color, 1 imprint location orders. About this Bic Ecolution Paper Mouse Pad:Non-slip chipboard backing. Full Bleeds available. Free 4-Color Process imprint. Stock Background, call for. Made from paper stock containing 30% post-consumer recycled fiber. Due to the nature of the material, this product size is approximate. Product size may slightly vary.Materials: 60# off set containing 30% post-consumer recycled fiber. About this Aluminum Mouse Pad:Non-Slip BaseSpecial Instructions:Rush Service:Catalog Quantities Only.One Color And One Location. About this BIC(R) Ultra Thin Firm Surface Stock Shape Mouse Pad:Stock Shapes - Fabric, Firm & Ultra Thin Firm Surface Ultra Thin Firm Surface Stock Shapes. Stock Background, call for. Due to the nature of the material, this product size is approximate. Product size may slightly vary.Materials: Polyester and Rubber. About this Dye Sublimated Computer Mouse Pad - 5 Dia. :Printed with four color dye Sublimation process, these mouse pads will be sure to brighten up your office with dye sublimated high color definition printing.Great promotional product for giveaways, promotions, or just for fun!5" Diameter x 1/16" Depth.Improved nonslip surface.Special Instructions:Blank items not available. About this Heart Shaped Computer Mouse Pad - Dye Sublimated:Printed with four color dye Sublimation process, these mouse pads will be sure to brighten up your office with high color and definition printing.Great promotional product for giveaways, promotions, or just for fun!5" W x 5" H x 1/16" D.Improved nonslip surface.Special Instructions:Blank items not available. About this House Shaped Dye Sublimated Computer Mouse Pad:Printed with four color dye Sublimation process, these mouse pads will be sure to brighten up your office with high color and definition printing.Great promotional product for giveaways, promotions, or just for fun!5" W x 5" H x 1/16" D.Improved nonslip surface.Special Instructions:Blank items not available. About this Computer Mouse Pad - Dye Sublimated - 6:Made of microfiber with rubber backing.Lightweight to reduce shipping costs.Lower ergonomic profile 1/16".Nonslip surface.Special Instructions:Blank items not available. About this Wireless Charging Mouse Pad With Phone Stand:Charge Qi Enabled Devices Wirelessly By Placing Compatible Device On Charging Pad Charging Pad Doubles As A Phone StandLED Indicator LightsFeatures A Micro USB Input Output: 5 Volts/.8 Amp39" Cord Activates When Connected With An A/C Wall Adapter Compatible phones include some of the following: Apple iPhone: 8, 8 Plus, X, XR, XS, XS MAX Samsung Galaxy: Note 9, S9, S9+, Note 8, S8, S8+, S7, S7 Edge (Plus more devices) Sony: Xperia XZ3, Xperia XZ2 Premium, Xperia XZ2 (Plus more devices) *Please check your device specifications prior to purchase. About this Full Color Rectangle Mouse Pad:Made Of 1/8" Rubber.Customize With Your Own Art. About this Computer Mouse Pad - Dye Sublimated:Made of microfiber with rubber backing.Lightweight to reduce shipping costs.Lower ergonomic profile 1/16".Nonslip surface.Special Instructions:Blank items not available. About this Crossroads Mousepad:Soft wrist support. Large surface area for full size mouse. Manufactured By Leeds. Note: Instructions Included: No Materials: UltraHyde ***Due to the nature of the material, this product size is approximate. Product size may slightly vary. Related Search Terms:Mouse Pad , MousepadSpecial Instructions:Other imprint methods/areas may be available; please call for details. Please note that product images may not depict the standard imprint method included in pricing. About this Microfiber Mouse Pad:Dual purpose microfiber mouse pad.Use as a mouse pad and to clean your screen. About this Cache Mouse Pad with USB Hub:The Cache Mouse Pad with USB Hubs features with soft mouse pad and USB 2.0 hubs with three outputs. The micro to USB cable stores into the left compartment which also can store some accessories like office clips when cable is out of compartment for connecting.Material: Polyurethane foam with polyester surface.Special Instructions:1 Day Rush, available upon request for 1 color, 1 imprint location orders. Thank you Janet, Autumn and Camila! We’re glad to read your positive reviews on out Non-Skid Computer Mouse Pad. This promotional custom mouse pad is our top seller in this category. This mouse pad is perfect to display your logo! You’ll have enough space to market your company! Everyone needs a mouse pad, so why not put your logo on one? With a large imprint area for Screen Printing you can be sure your message is clear as day every time your customer powers up their computer. Made of a Non-Skid Foam Rubber Base, this custom personalized mouse pad is durable and sure to last. Available in black, red, blue, teal, and gray. Thank you Angelina and Naomi for your reviews! We are glad to read positive reviews on the Solid Jersey Gel Mouse Pad/Wrist Rest. These promotional mouse pads are perfect to rest your wrist on. Avoid any future injuries with our promotional Solid Jersey Gel Mouse Pad/Wrist Rest. In fact, this custom mouse pad is a top seller because of it’s gel feeling. It will help rest your wrist as you move your mouse around. Order your Solid Jersey Gel Mouse Pad/Wrist Rest here. Thank you Adam and Manley! We’re glad to read your positive reviews! This promotional mouse pad is a top seller because of its 4 Color process imprint method offered. Cloth covered mousepad with 1/8" thick rubber backing. In our selection of promotional mouse pads, we have different styles, colors, and sizes available. With over 180 mouse pads, you’ll have no problem finding the perfect one for your company! We have non-skid mouse pads, paper mouse pads, gel mouse pads, foam mouse pads, mouse pads with phone holders, and more! Mouse pads are perfect for everyone, especially for all computer users! If you’re going to a tech trade show, then a mouse pad will make a perfect promotional giveaway! Customers will love to take mouse pads home to add on their desk. 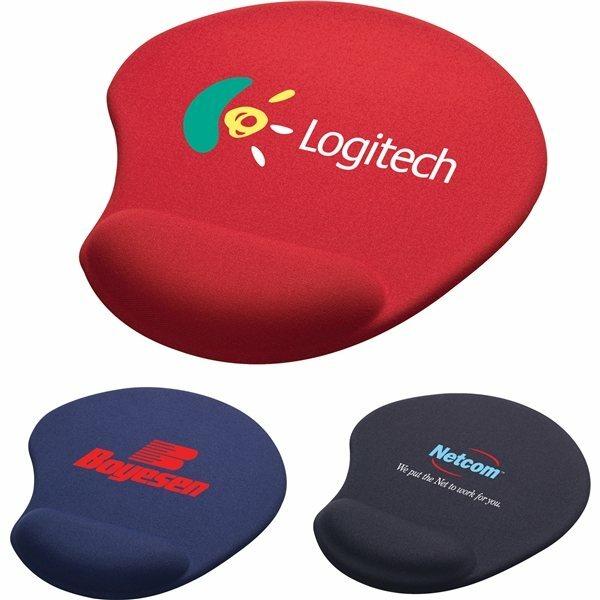 Promotional mouse pads are perfect to represent your logo. If you want your customers your logo to be nice and big, mouse pads are perfect! Look through our selection of mouse pads. Shop here! Just like our customers, AnyPromo sets the bar high when it comes to making big brand impact, while getting the best bang for your buck! Click through our inventory of technology accessories to find what best fits your goals. These event must-haves will be in high demand instead of winding up in the trash. Save money and make a BIG hit at events with our specially priced computer accessories. Great for all types of tedious computer work, mouse pads make mouse navigation easier. Check out our mouse pads on sale now. Let's make marketing make cents! Below you’ll find a most wanted list of some of our trending technology accessories. Every item is available and ready for ordering through our helpful staff. Scroll on! .015" Peel&Place Base + Vynex Surface Frame-It® Window Mouse Pads, .015" x 7.5" x 8"
1/8" Heavy Duty Base + Vynex Surface Frame-It® Window Mouse Pads, 1/8" x 8" x 9 1/2"
1/16" Vynex® DuraTec® Mouse Pad, 1/16" x 7" x 8"
Grab your promo mouse pads today! Promotional mouse pads are popular giveaways. Whether you're exhibiting at a trade show or handing these out as an employee incentive, mouse pads are useful to have! Not sure whether mouse pads are the perfect option? Think about how many customers use computers at home, in their office, or at school. Mouse pads are always convenient to have! Our featured list of mouse pads are currently trending in this category. You won’t want to miss out on checking these options!